One of the hardest parts of becoming a household that eats much healthier is the foods you have to give up. I’m a junkie for junk food and boy do I miss those greasy, fried potatoes sold in most places you can get a burger. There is a place here in OKC over in the Plaza District called “The Mule" that serves beer battered fries… I mean, LORDY, I could eat my weight in them. Especially when they are served as poutine with cheese curds and gravy… it’s horrible but amazing, mostly amazing, all at the same time. 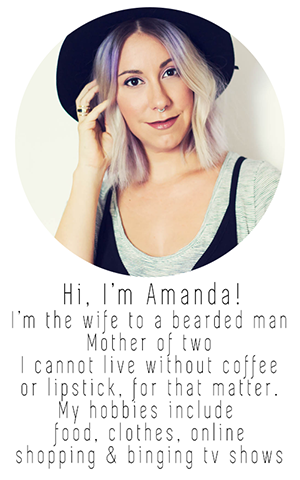 My husband is also a junkie, just like I am, which makes us a dangerous pair. Who wants baked chicken for dinner? I mean pizza sounds good… you like pizza too? Good, lets order a pizza. Maybe some chinese food on the side? Excellent. My menu change has been a bit hard on him, letting go of all the fast and yummy food. So when I made these little fries one night, he immediately became addicted. 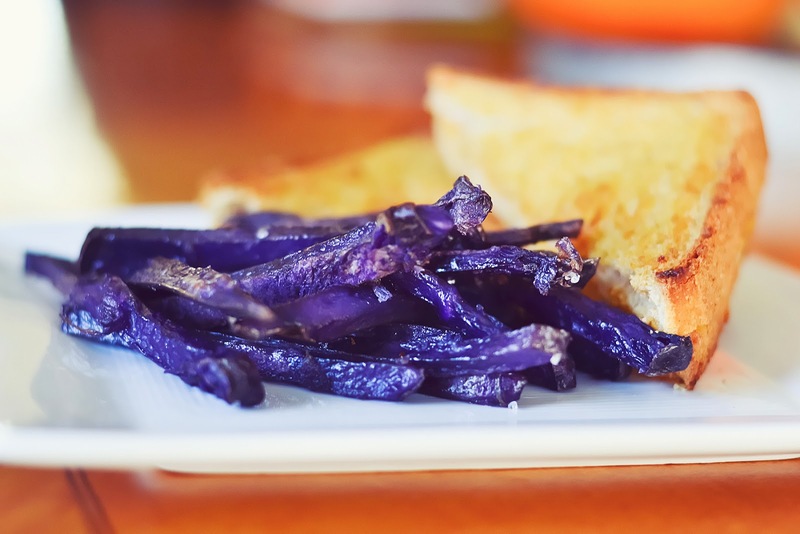 They’re not fried and there are only three ingredients, one of them being his beloved purple potato. 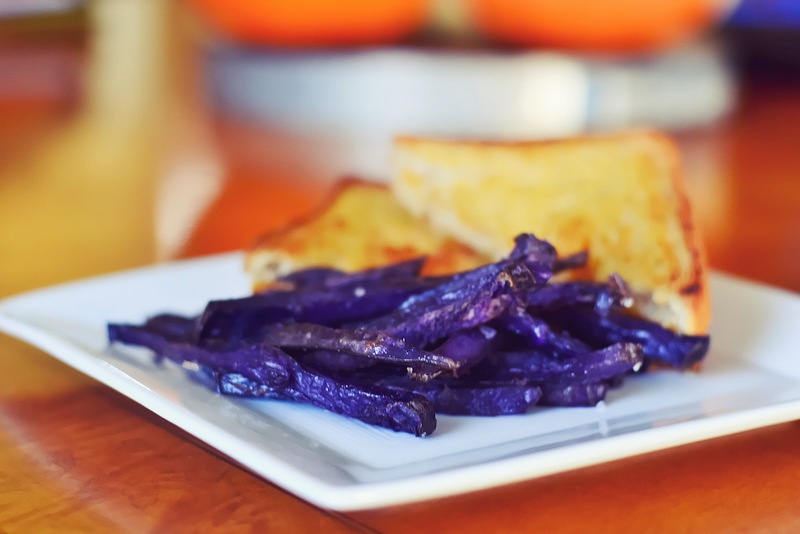 I love the purple potato too, she just has a nice earthy flavor, more than your basic russet potato. I don’t have any of those fancy gadgets like a french fry slicer, I just use a sharp knife and slice everything down to the proper size. 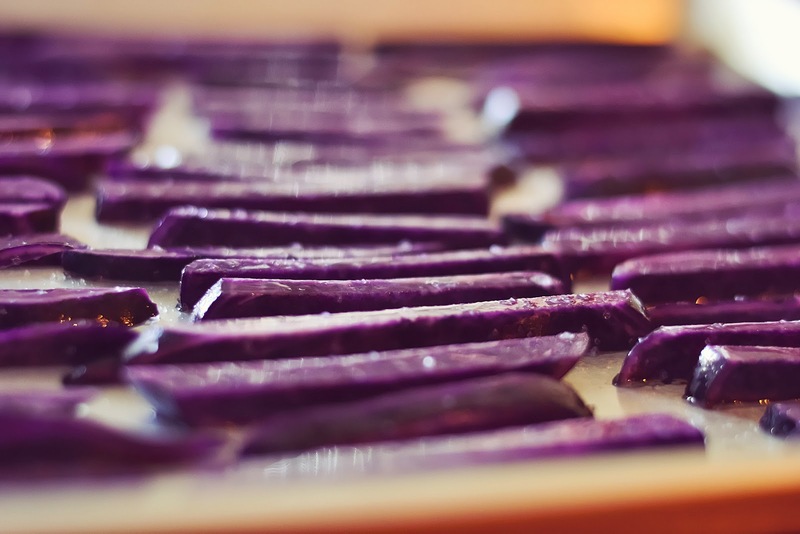 For purple potatoes, I do not peel them, I like the leave the skin on. It’s a personal preference and depending on the potato you’re working with, you may want to skin them. 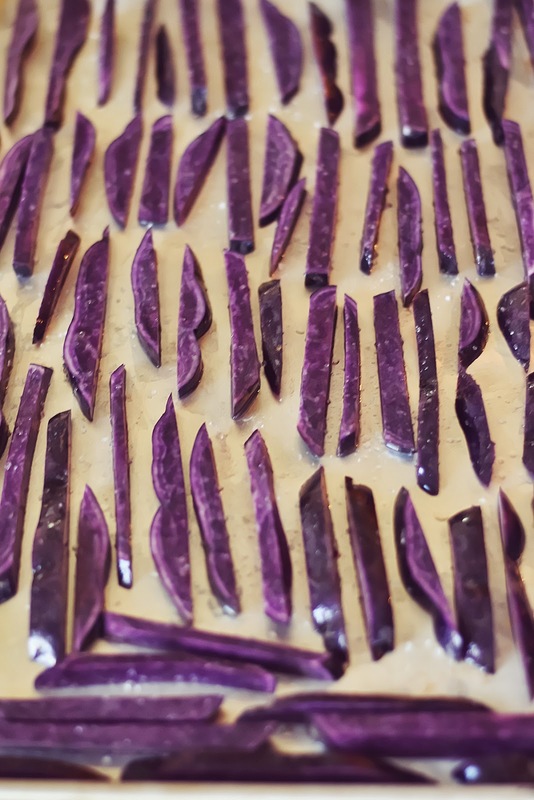 I have used this recipe of sweet potatoes too, which rocks, and I have to skin them. Start by slicing the potatoes. Skin them first if you prefer and then slice them down until they look like fries. Toss them in a bowl as you go. Add olive oil. I start with one tablespoon and toss all the fries around in the bowl, if I don’t feel like they are all coated, I’ll add another tablespoon. The amount of oil you need will vary depending on how many potatoes you cut. Add Salt. I have a sea salt grinder, so I grind it about 5-6 times over the potatoes. I’d venture to say this is about a teaspoon, but salt as you like. More or less depending on your taste. A good rule of thumb is to start with less because you can always add more later, you can’t take it back once they’re too salty. Onto the Pan. 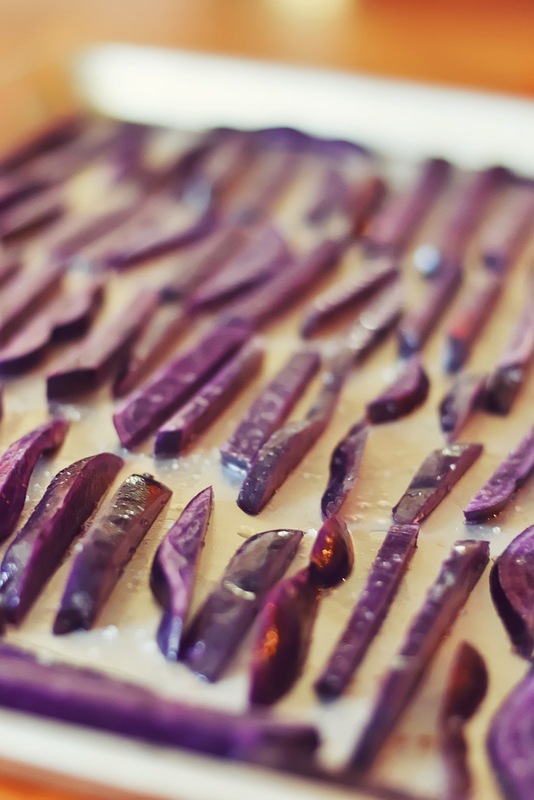 Spray your baking sheet with a little pam [if you don’t, they’ll stick] and lay them out in a single layer, no overlapping potatoes! Into the oven. Your oven should be heated by now, so just slide these puppies in and let them bake 20-30 minutes, depending on how you like your fries cooked. Keep an eye on them, they’re thin enough to burn if you get distracted. Once they’re done to you’re liking, pull them out and let them cool for 5 minutes. Serve! This is how picture perfect I lay mine out on the pan. Silly? Maybe just a little. But the fries are still perfect. We served ours on the side of a grilled cheese that evening but we have also paired them with baked chicken and fried chicken. Yep, I totally fried some chicken to please my soul the other day. We’ve recently abandoned the idea that every meal must be big, warm and prepared. Some nights it is just a sandwich or fruit with cheese, my weight is not against this idea since it’s dropping. And a question to finish! 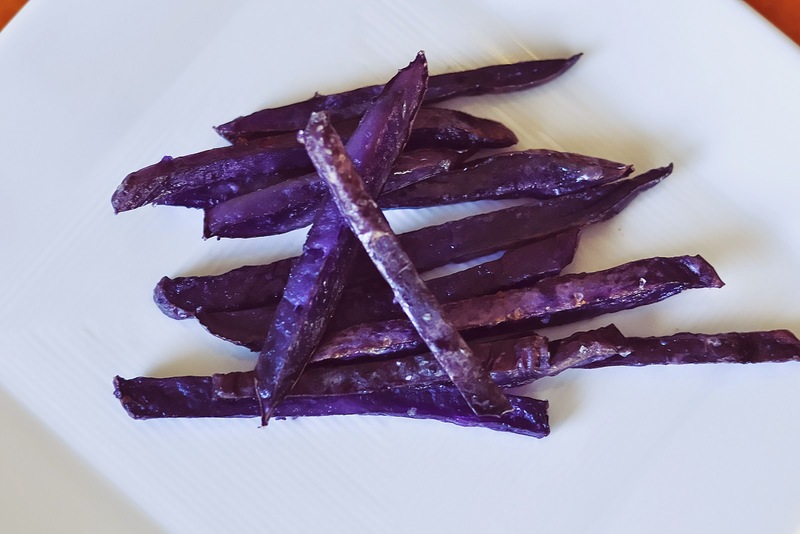 Where do I find PURPLE potatoes? The ones I use are not the normal little “new potatoes” you find bagged up in the grocery store, these are full size potatoes. I buy mine at the nearest Sprouts Market but I have also seen them at Whole Foods. I think you need to go somewhere that carries healthier foods and produce to find them. I have never seen them in the normal grocery stores, Target or Walmart, at least not around here. I buy them by the pound, so they should be stacked around the normal potatoes, somewhere. Don’t forget, I said this rocks on sweet potatoes too! And I know you can find those in a normal store.